This was my breakfast today! Look! It has been raining incessantly for the last three days here. But I’m not complaining. We’ve had a prolonged drought here in California so we’re welcoming the rain with great gusto. But this morning, the cloudy, grey weather got to me, so I had to channel some sunshine into my mood somehow. Sunshine = tropics, tropical weather = coconut. 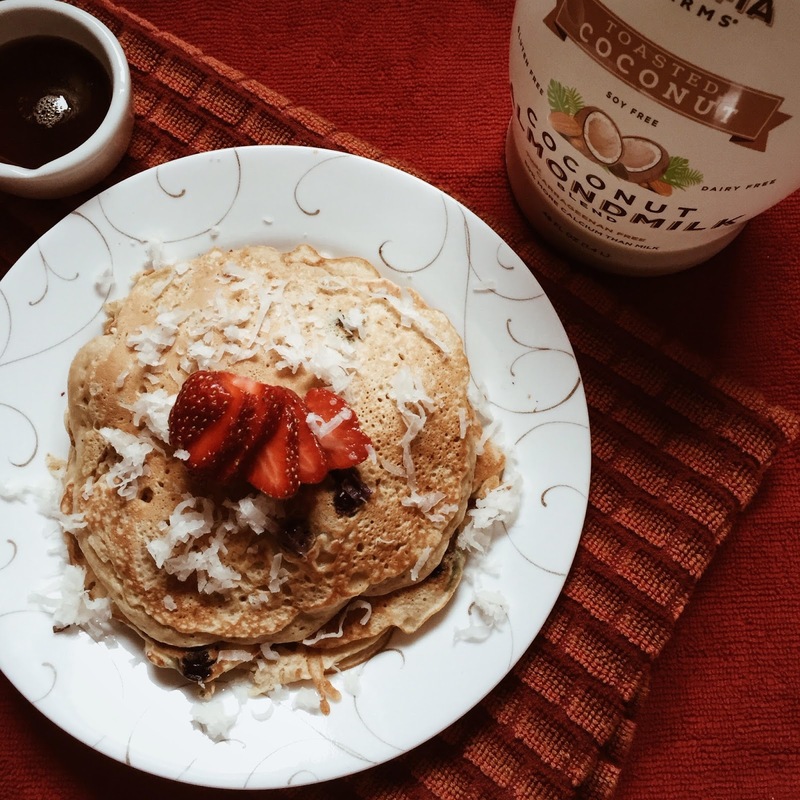 Coconut pancakes for breakfast! Ta-daaa! 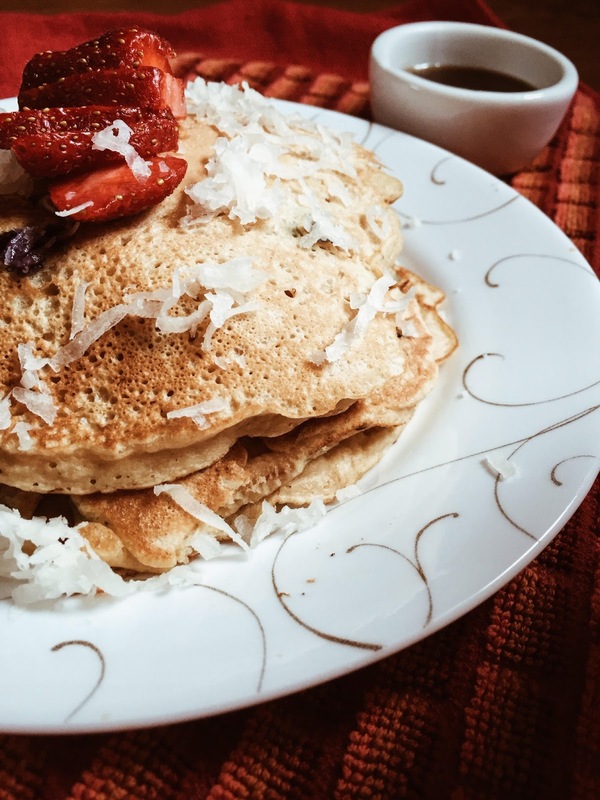 I found a great recipe on Pinterest – Coconut Pancakes from Amy Johnson who blogs at ‘She wears Many Hats’. I deviated from her recipe and made it healthier by adding wheat flour. And for the coconut milk part, I used an Almond Coconut Milk Blend from Califia Farms. 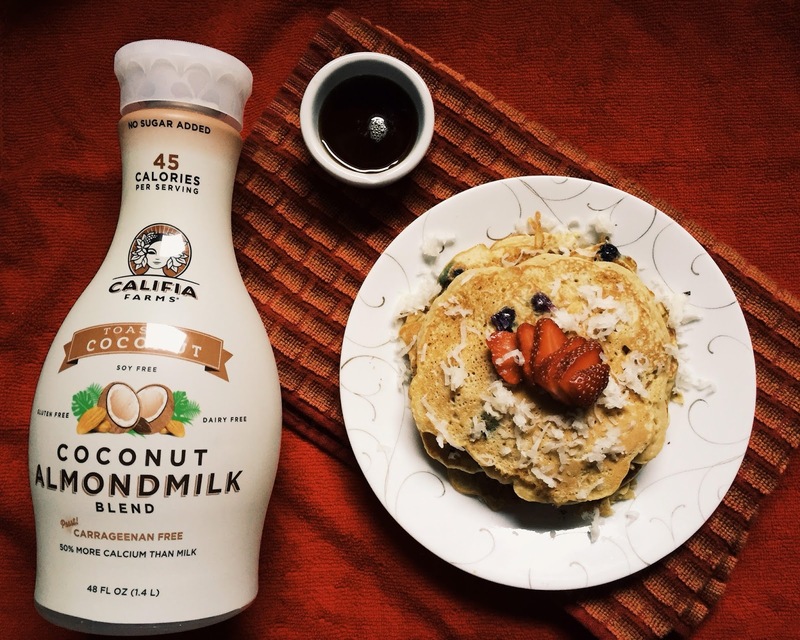 I’m a recent convert to Califia Farms and I use their Toasted Coconut milk almost everyday in my overnight oats. It has the right amount of creaminess for the oats to soak in and it results in the perfect porridge-y consistency which I love. 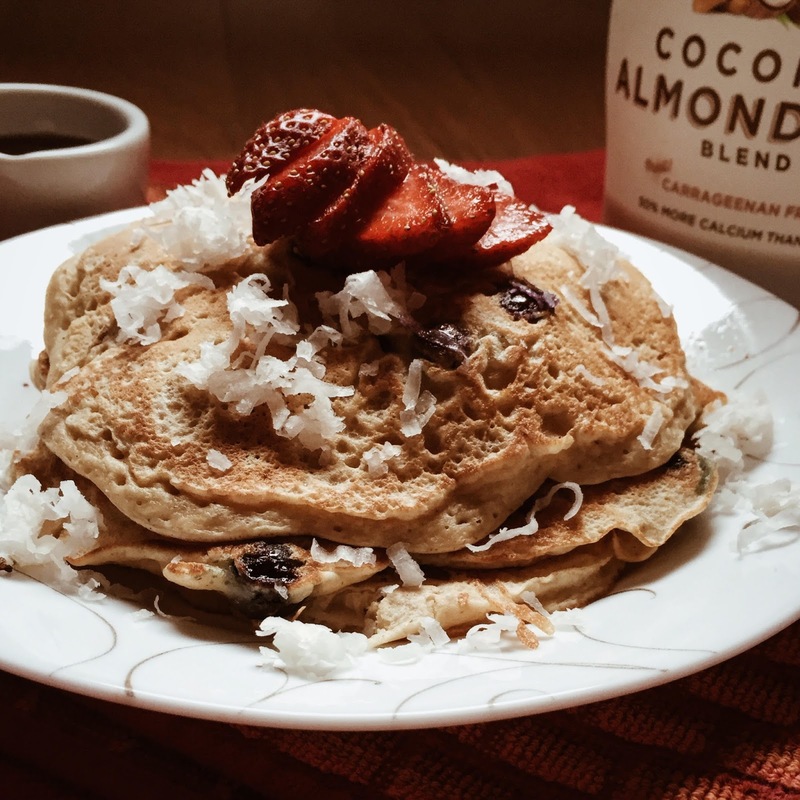 Here’s my version of Coconut-Blueberry Pancakes. This recipe will make about 8 pancakes. In a bowl, lightly mix all the dry ingredients (the first seven in the ingredient list). Add the wet ingredients into the dry and mix until properly incorporated. Finally, gently fold the blueberries into the batter. Pour a medium sized dollop of batter on to a heated, greased pan. I normally use my 1/2 cup measure and since I prefer thinner pancakes, I spread the batter around a little by tilting the pan. Once bubbles appear on the pancake, flip it and let it go for another minute or two until underside is cooked and the pancake is golden brown. Serve warm with more berries and maple syrup. Wow what a wonderful breakfast you had. The pancakes looks tempting and totally melt in mouth kind.